Earning the highest possible score in the criteria of product vision, Cross-channel/format capabilities, and Ad-building tools, RevJet has been recognized as a Leader in The Forrester Wave™: Creative Advertising Technologies, Q4 2018. 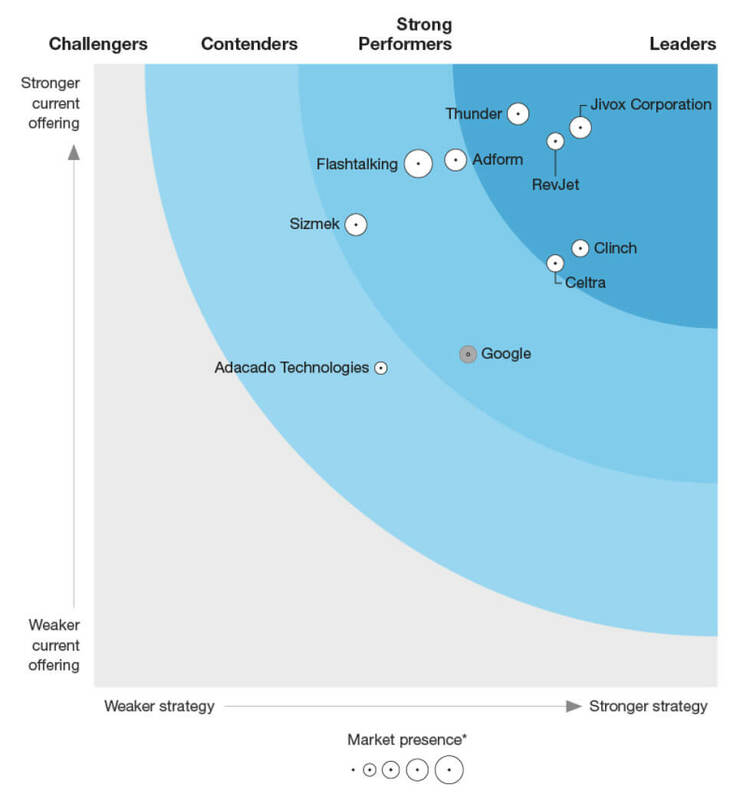 Read the report to learn why Forrester Research recognized RevJet for focusing 'on simplicity without sacrificing sophistication,' concluding that 'data-rich marketers looking for a [SaaS] solution and a partner to grow and innovate with should consider RevJet." Vendors in the assessment: Adacado Technologies, Adform, Celtra, Clinch, Flashtalking, Google, Jivox Corporation, RevJet, Sizmek, and Thunder. The RevJet Ad Experience Platform is the first enterprise-grade SaaS platform that orchestrates meaningful, personalized ad creative experiences at scale. RevJet was purpose-built to power all ad creative use cases including dynamic creative optimization (DCO), personalization, audience management, creative performance visualization, experimentation, and self-optimizing performance competitions.